Dynamic Corvettes Is Lucky To Have A Fiberglass Department Dedicated To Making Parts For In House And For Purchase Though Ebay Or Phone For The Public. Each Part Is Hand Laid And Manufactured Here In The State Of Michigan. Over The Course Of This Article, We Hope To Educate You As To Why You Should Choose Dynamic Corvettes For Your Classic Corvette Fiberglass Parts. What is a “hand-laid” fiberglass part? A hand-laid fiberglass part is exactly how it sounds. Strips and sheets of 1.5 oz. and 3 oz. fiberglass woven mat are laid on the mold and infused with resin by hand. Workers then use rollers to push out any air that has become trapped by the resin and continue to add layers of fiberglass until the wanted thickness of the part is achieved. What is a “chopper gun” fiberglass part? 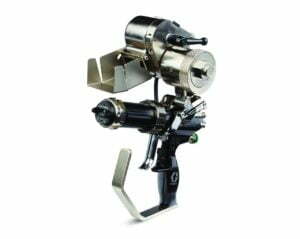 A chopper gun fiberglass part is made by using a special piece of equipment, a chopper gun. This piece of equipment combines finely chopped strands of fiberglass and resin in a spray form by using pressurized air from an air compressor. While using the chopper gun, the worker will spray the fiberglass and resin directly into / onto the mold which is then followed up by workers rolling out the trapped air pockets. The major difference is the final quality and thickness of the part. Chopper guns allow human error of too much product in the corners and not enough in the flat areas. 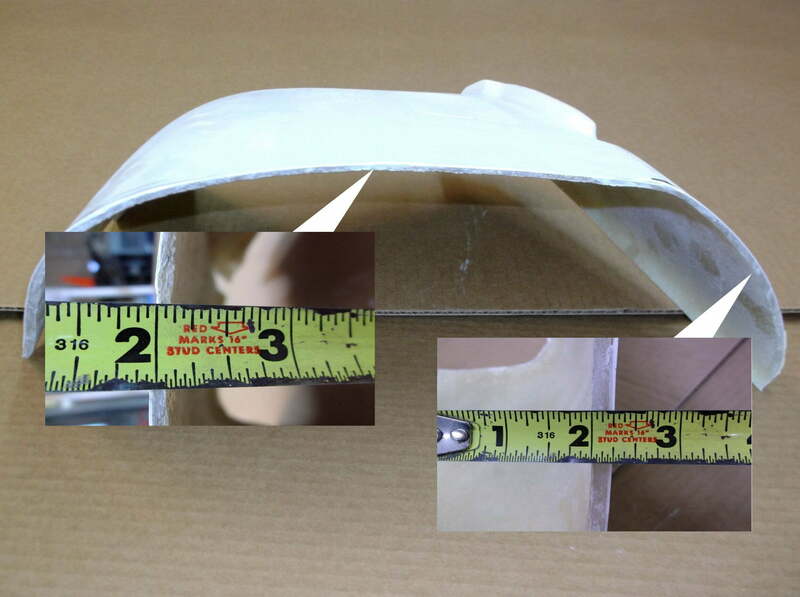 Let’s take a look at the picture below showing a fiberglass part that has been made using the chopper gun method. As shown in the call outs, the outer section of the part is a full quarter (1/4) of an inch thick while the center area is only an eighth (1/8) of an inch thick. Now let’s look at a hand-laid fiberglass part (pictured below). 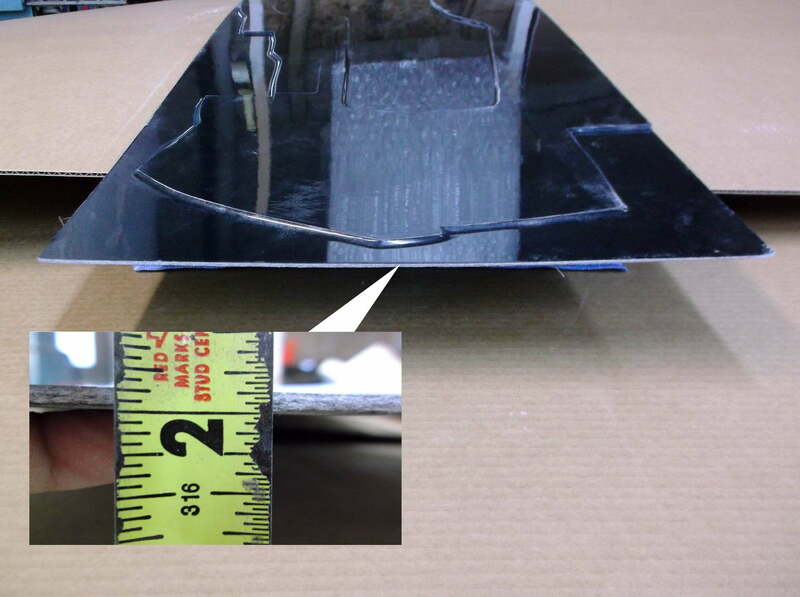 As noted in the callout, the entire thickness of the part is uniform to an eighth of an inch. When the strength of a part is in question, the winner is hand-laid again. This is due to the fact that the hand-laid fiberglass is woven together into sheets and strips before being infused with resin and pressed into the mold. This woven fabric allows the fiberglass strands to interlock with each other while infused with resin. 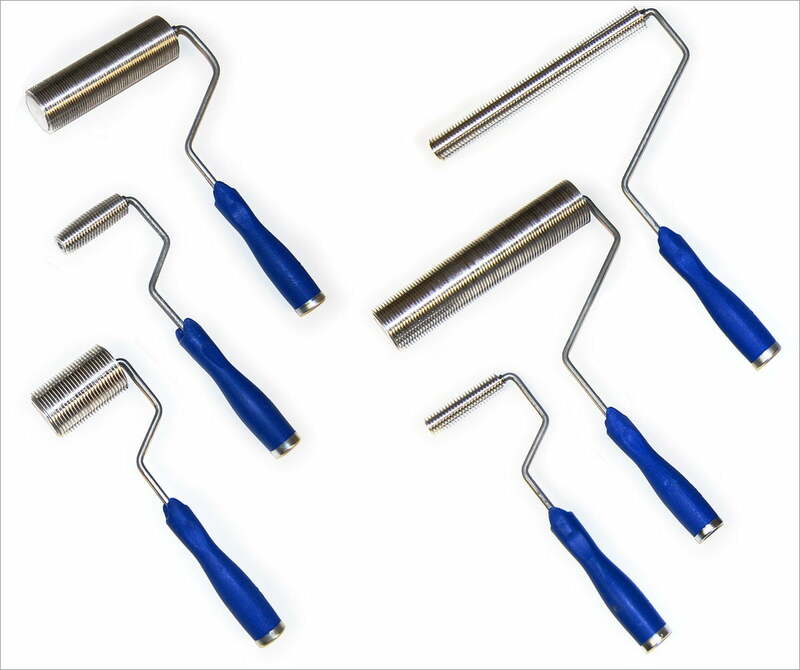 This strength allows the part to bend and flex without breaking or cracking. With the chopper gun method, the strands are loosely “blown” at the mold and are placed at random. It is true that some of the fiberglass strands will weave together and interlock, but this method does not create as strong a part than the hand laid method. This weakness is also due to the resin heavy areas in the corners. When areas of a part have more resin than fiberglass, that section of the part is more brittle. Brittleness can lead to spider / stress cracking, and chipping over time. Which is better, hand-laid or chopper gun? While both have their benefits for their different applications, hand-laid parts are the best way to go with your Corvette. Installing a uniform and quality fiberglass part makes fitment and installation easier on the vehicle.Chopper gun made parts are typically less-expensive and are quicker to turn out but have the quality issues that we mentioned earlier. Good uses for chopper gun made products would be fiberglass pools, showers, and other residential items in which fitment and weight are not an issue. This is why Dynamic Corvettes only uses the hand-laid method on all of our in-house production fiberglass parts. You can be rest assured that when buying a fiberglass part from Dynamic Corvettes that you are getting the finest quality part available on the market at competitive prices. What is General Purpose resin? General Purpose resin is a polyester based resin and is also currently the most inexpensive resin on the market. General Purpose resin is used when weight and strength are not key issues for the use of the part. For example, an item like a fiberglass stall shower would be made with General Purpose resin due to the fact that weight of the fiberglass panels will not be an issue. General Purpose resins are used mainly in the construction of fiberglass boats and ships, and they are supplemented with other resins in locations where higher strength is needed. General Purpose resins can take 14 – 24 hours to completely cure. While curing, the resin can reach temperatures of 430 degrees F. This heat is caused by the chemical reaction of the resin meeting the catalyst to form solid polymer molecular chains. What is Vinyl Ester resin? Vinyl Ester resin is another polyester based resin, but it has been strengthened by epoxy molecules attached to the polyester chemical chain. Vinyl Ester is slightly more expensive than General Purpose because of this added strength. Because of Vinyl Ester’s added strength, it is ideal for making replacement fiberglass parts that will be under constant assault from road debris, stones, and rude people in the grocery store parking lot. Vinyl Ester resins are used also in the the construction of fiberglass boats and ships but are used lightly due to the added cost. Vinyl Ester resins take less time to cure than General Purpose, only 8 – 14 hours and while curing can reach temperatures of 240 degrees F. Again, this heat is caused by the chemical reaction of the resin meeting the catalyst to form solid polymer/epoxy molecular chains. What does Dynamic Corvettes use? 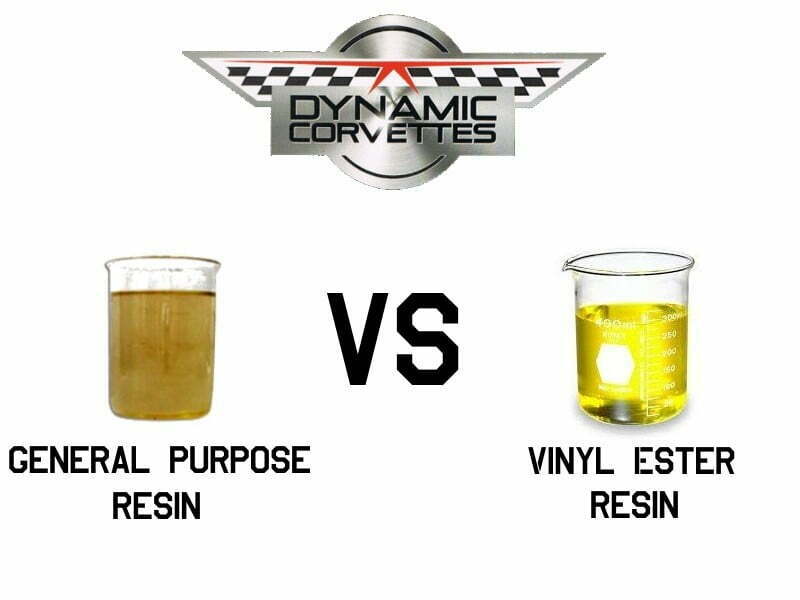 Dynamic Corvettes only uses Vinyl Ester resins in their hand-laid fiberglass parts and molds. This is in line with our company mission to provide the highest quality and the most competitive prices. As a company we recognize that our customers have come to expect the utmost perfection from the experts at Dynamic Corvettes, and that perfection is something we are proud of.